I arrived in Shanghai, but the jet lag kept me awake while everyone was already sleeping in the hostel. Therefore, I painted the guitar that stood in the common room, and made up my mind to finish the picture in Shangri-La, as this city, with its mystical name, was the one we set out to on the second day. At first, everything went smoothly and we made good progress. However, it was the beginning of January and the middle of winter in China. The farther west and the higher we got, the colder it got. In Lijiang, shortly before our destination, the road was closed due to snow. “We can stay here,” suggested Bruno. 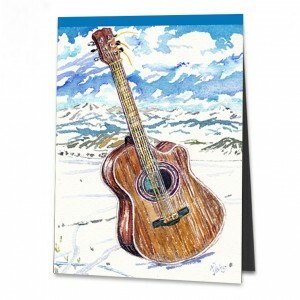 The unfinished painting of the guitar, however, was in the luggage. And so it was taken high and higher still in the bus, until the clouds were below us and we drove over a delightful plateau 3,200 meters (10,500 ft) above sea level, far and snowy, the sky clear and blue. The mountainous horizon of Shangri-La I painted at the hostel behind a windowpane. I can still remember well how excited, and yet calm at the same time, I was there. Later, I painted two more images. A stupa with colourful prayer flags and the little yaks. Bruno kept me company and we both were amazed in the late afternoon, as we saw ice crystals as large as hailstones lay on my paper. There was not a cloud in the sky, where did they come from? It was the temperature, which quickly sank now, freezing the water, turning the brush into an unruly broom. Ugghh, at night the temperatures dropped to even minus 25 degrees. This trip has given birth to a deep desire: to return and travel to Tibet, which lies mysterious and hidden in the horizon of Shangri-La.